The ECB was set up in 1998, a central bank without a fiscal counterpart. To soothe German fears that it would go too easy on inflation, it was based in Frankfurt and modelled on the Bundesbank. Its intellectual direction came from its chief economist, Otmar Issing, a former Bundesbank rate-setter. Like other central banks, it targeted inflation. But to appease the Germans, it also concerned itself with the rate of money-supply growth. Two decades on, the Bundesbank’s influence has waned. The ECB focuses less on the money supply, after its link with inflation proved wildly unstable. Philip Lane, a doveish Irishman, takes over as chief economist in June. Neither the economic nor monetary-policy areas is overseen by a German staff member. To see why the choice of successor for Mr Draghi is so important, consider what he has done—and left undone. Observers are gushing: one compares him to Cincinnatus, a loyal citizen who saved the Roman republic from invasion. His open-minded pursuit of price stability led to the use of unconventional tools such as quantitative easing (QE) to stave off deflation, despite northern members’ horror of monetising government debt. Like other central banks, the ECB has gained bank-supervision and macroprudential powers since the crisis. Fittingly for a governor who sees communication as central to his role, his biggest policy intervention was uttered but not implemented. In 2012 he said he would do “whatever it takes” to save the euro, promising to buy unlimited amounts of government bonds if sovereigns hit trouble. 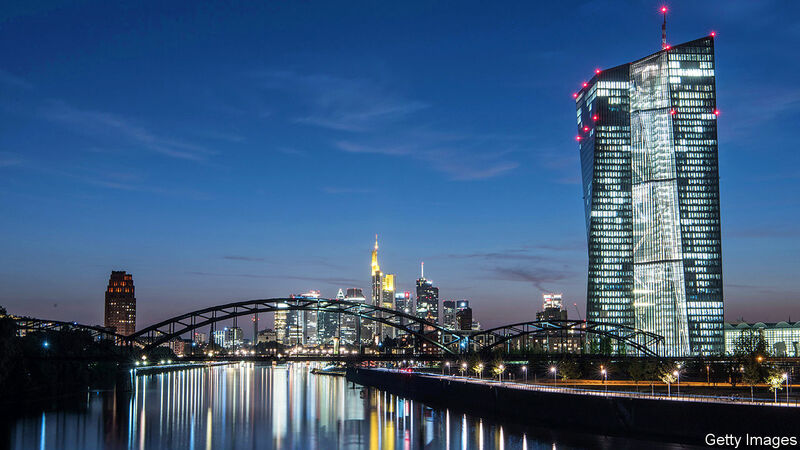 The ECB’s communications compare well with those of other big central banks, says Marcel Fratzscher, a former staffer now at DIW, a think-tank. Recent policy shifts have caused remarkably little market volatility, unlike some by the Federal Reserve. The next boss, though, will need to overhaul the bank’s monetary-policy strategy. Mr Draghi seems almost certain to depart having never raised interest rates; price pressures and inflation expectations, currently subdued, are likely still to be well below target. An economic slowdown kiboshed rate rises this year: on April 10th the bank promised to keep them on hold in 2019. They are already at rock-bottom levels, and the bank has bought €2.6trn ($3trn) of government bonds. Should the slowdown worsen, the new boss will have to find the firepower to reassure markets. The ECB’s independence is a matter of international law. EU members must all agree to any changes to its mandate. But another risk defies any attempt to legislate: that of politicised appointments to its governing council. National central-bank governors are often picked for reasons of domestic politics. The march of populism across the continent complicates matters. Austria’s incoming central-bank boss has no monetary-policy experience and is reportedly linked to the FPö, a hard-right party. Italy’s populists want to “reboot” their central bank’s management. Such appointments could exacerbate divisions among the governing council, which tend to be along national lines. It must set policy for the euro zone as a whole. But some members still play to domestic audiences. Take the decisions to announce outright monetary transactions (OMTs) that backed up Mr Draghi’s “whatever it takes” commitment, and to begin QE. Both were attacked by some northern central-bank governors and faced legal challenge in Germany. Jens Weidmann, the head of the Bundesbank and a possible successor to Mr Draghi, testified against OMTs. One interpretation of a ruling on QE by the European Court of Justice in 2018 is that the ECB has room to raise self-imposed limits on the share of government bonds it can buy in each member country. But heightened national divisions would make it harder to build support in the governing council. It might not help that, according to the Eurobarometer poll, public trust in the bank is far below pre-crisis levels both in countries like Spain and Greece, where the ECB is regarded by some as partly to blame for austerity, and in Germany, no fan of low interest rates and bond-buying. As the ECB gains powers, clashes with politicians become more likely. It now oversees large lenders, in which governments also take a keen interest. Last year, under pressure from the European Parliament, its supervisory arm toned down a plan to ask banks to make more provisions for non-performing loans. It also withdrew a request for new powers to centralise the regulation of clearing houses. Governments had sought to narrow their scope; the bank says that threatened its ability to conduct independent monetary policy. The ECB keeps banking supervision and monetary policy quite separate. But the president will set the tone of its response to political pressure, argues Sir Paul Tucker, a former deputy governor of the Bank of England who has written a book on the power of central banks in democracies. 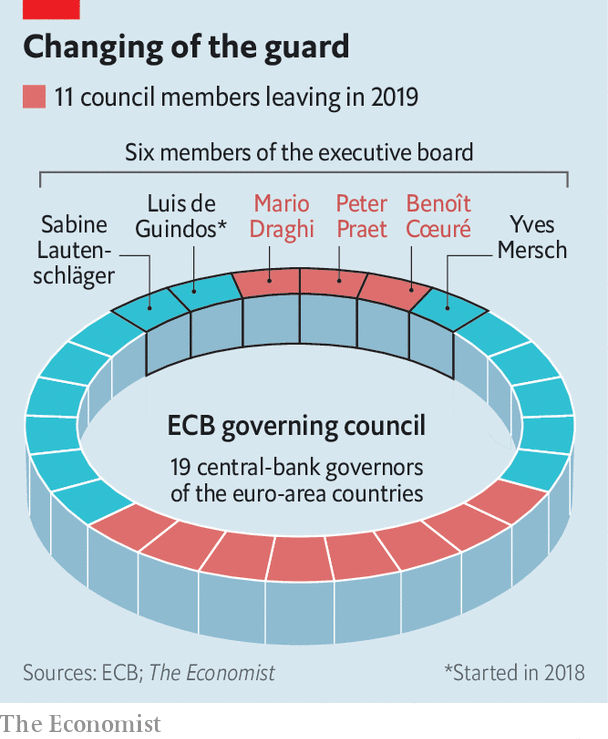 And Mr Draghi’s successor will need great skill to nudge governments to speed up fiscal and banking reforms, he says, to avoid monetary policy being the only game in town. That person will have to direct the bank’s efforts to return inflation to target, and perhaps deal with a recession, while balancing competing political interests. If its only functioning economic institution stumbles, so too will the euro zone.